What can I do to stop my locs from being frizzy all the time? Does that sound like a question that you ask yourself (or Youtube) often? Well, hopefully you’ve checked out the “Top 4 Reasons Why Locs Are Frizzy” and that gave you some insight into the cause(s) behind your frizz, and now I’ll share with you a few simple ways that you can use to control the frizz. Styles that help to bind the hair together and minimize manipulation are known as compression styles. By wearing compression styles, you help to encourage the loose hair to mesh into the shaft of the locs. An example of a compression style is Rope Twists. The use of compression styles are really great for locs that are in the teenage phase. This is one of my favorite techniques for keeping mature locs moisturized and with less frizz. As I’m sure you already know, you can brush your locs while wet or dry, but loc brushing while wet is best for minimizing frizz. The use of interlocking definitely helps to control frizz— particularly at the roots. 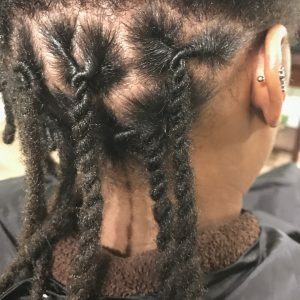 If you’re someone whose hair grows around the loc, instead of with the loc, then you would benefit from using the integrating interlocking technique to bring your hairs back into the loc. However, you do want to be careful not to damage your locs by switching from palm rolling to interlocking. Much like the instant loc technique, a loc refinement can be done to bring the external frizz into the loc using a crochet hook. This is very effective for mature locs (and even thick locs) without causing damage as long as the crochet hook is very tiny (less than 0.5mm). Whichever method that you find that is best for you and your locs is great, just make sure you never (ever, ever, everrr) use scissors!! Trimming the frizzy hair from around your locs with scissors with weaken the locs and lead to thinning and breakage. How do you control frizz? Leave me a comment!